In the fall of 2014, PSU member and On Blast producer, Mahala Papadopoulos set out to learn more about high stakes standardized testing in the School District of Philadelphia. Through an analysis of student perspectives, the profitable business of testing and the growing Opt Out Movement, Mahala gets deep into the unresolved issues of high stakes standardized testing. On Blast is a podcast produced by members of the Philadelphia Student Union. 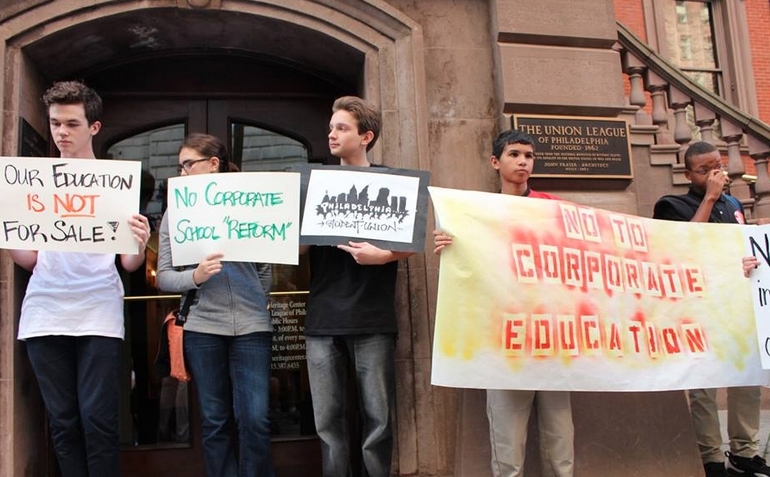 At the Philadelphia Student Union, we believe that young people have a complex analysis about their schools and communities. We believe that in order to fight and organize around systems of oppression, we must understand how mainstream media creates narratives that keep the public at ease with the status quo. When media is used as an organizing tool it serves the dual purpose of creatively expressing an analysis and pushing back against oppressive narratives. For our work, media creation and analysis is key. To listen to more student-produced content from the Philadelphia Student Union, search for On Blast on iTunes or any podcast provider. Or visit our podcast’s website, here.